BREAKING NEWS: SodaStream announces plans to close illegal settlement factory in response to the growing boycott campaign. We’re still waiting to see the doors close. Grassroots groups across the globe continue the boycott until SodaStream stops displacing Palestinians, from the West Bank to the Negev. Join people of conscience who refuse to water down justice and human rights. Don’t buy SodaStream and demand local stores remove SodaStream from their shelves. 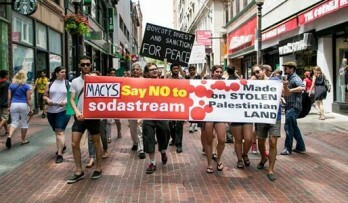 The Boycott SodaStream working group of Jewish Voice for Peace-Boston and American Friends Service Committee have targeted chain stores that carry SodaStream with protests, flashmobs and holiday caroling. They are currently in conversation with local store owners about de-shelving SodaStream. Get involved with the Boston JVP chapter. Jewish Voice for Peace-NY collaborated with Adalah-NY and Park Slope Food Coop Members for BDSto bring the national campaign against settlement profiteers, SodaStream, to New York City. Their December kick-off action, part of the National SodaStream Days of Action, drew over 100 people to Target in Downtown Brooklyn. To get involved with the New York chapter, email newyork@jewishvoiceforpeace.org. 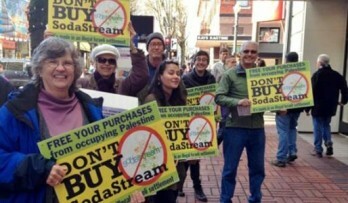 JVP-Seattle is working to get Sur La Table to stop selling SodaStream. 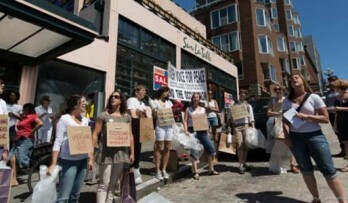 We’re ramping up the pressure on the Sur La Table headquarters is in Seattle! We hold actions at Sur La Table stores and online. Email seattle@jvp.org to get involved. Jewish Voice for Peace-Portland has been out on the streets with the Portland BDS Coalition protesting SodaStream every Saturday from Thanksgiving through Christmas, as well as Black Friday and Dec 26th. 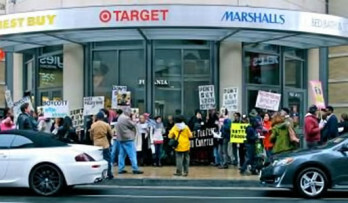 We protested in front of Target and Macy’s in downtown Portland, in the heart of the shopping district. We send a strong message to shoppers to boycott SodaStream’s occupation profiteering. As well as participating in the National SodaStream Days of Action, the local chapter has been part of the letter writing campaign to corporate CEOs demanding they de-shelve SodaStream. Email info@auphr.org to get involved. JVP-DCMetro participated in all of the national SodaStream Boycott days/weeks of action during the holiday shopping season – featuring SodaStream-themed Hannukah/Christmas songs. Media coverage has included MSNBC’s Chris Hayes Show (for Superbowl 2013 by sports writer/commentator, Dave Zirin), the Washington Report for Middle East Affairs, DC Direct Action News and other media outlets. Get involved through the JVP-DCMetro Facebook Page or via email. SodaStream profits from the Israeli occupation of Palestine and violates the rights of Palestinians to freedom, justice and self-determination. While SodaStream has announced plans to close their West Bank factory, we continue our boycott until SodaStream demonstrates that they are no longer profiting from displacing Palestinians and abusing their labor. SodaStream Displaces Palestinians: SodaStream is looking for an easy buck on the backs of Palestinian Displacement, from the West Bank to the Negev. SodaStream’s factory in the illegal settlements receives Israeli government subsidies to dispossess Palestinian basic resources: farm land, water, and pastures. SodaStream has yet to close its factory in the West Bank, as promised, and has announced plans to open a factory in the Negev/al-Naqab where they would receive more Israeli government subsidies to contribute to the ongoing displacement of Palestinian Bedouins. SodaStream abuses Palestinian workers, from the West Bank to the Negev. SodaStream doesn’t care about their workers, they’re a corporation who cares only about their bottom line. This summer SodaStream fired 60 Palestinian workers in response to worker demands for sufficient resources to allow them to observe Ramadaan during their work-shifts. SodaStream is in labor dispute with Bedouin workers in their factory in the Negev/al-Naqab over requiring 12-hour work shifts. Boycott, Divestment and Sanctions–collective acts of non-cooperation with occupation, militarism and discrimination–work! Occupation profiteer SodaStream’s stocks are crashing. Macy’s, a major department store in the US has de-shelved their product. The powerful grassroots movement for Palestinian human rights has succeeded in putting the heat on corporate human rights violator SodaStream. Read more about SodaStream on BDSMovement.net.